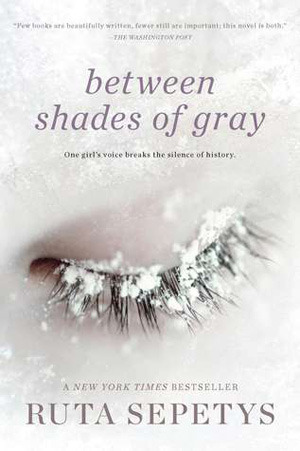 From Goodreads: Lina is just like any other fifteen-year-old Lithuanian girl in 1941. She paints, she draws, she gets crushes on boys. Until one night when Soviet officers barge into her home, tearing her family from the comfortable life they’ve known. Separated from her father, forced onto a crowded and dirty train car, Lina, her mother, and her young brother slowly make their way north, crossing the Arctic Circle, to a work camp in the coldest reaches of Siberia. Here they are forced, under Stalin’s orders, to dig for beets and fight for their lives under the cruelest of conditions. My book club picked this novel as their first read of the school year, and let me tell you, I was not happy. I didn’t want to read this book. I teach about the holocaust, WWII, Stalin, and I really didn’t want to read another book on the topic. Not at the beginning of the school year. I didn’t want to deal with anything depressing—and truth be told, I was completely sure I wouldn’t like it, that it’d be like all the other books I’d read about the holocaust. So I put it off, and I put it off… until the night before our first meeting and we’d talk about it. What kind of Book Club advisor would I be if I didn’t at least try to read the book? So I began reading it, and do you know what happened? I couldn’t stop. Between Shades Of Grey is absolutely amazing—it’s a haunting tale that is unlike any I’ve ever read on the subject, and it’s beautiful. It’s a story few really hear because Stalin’s reign of terror and his “camps” are usually swept under the mat—not many really know what he did to his people. Yet Sepetys lays it bare for her readers, and this story, her message, can’t be ignored. This is a novel that will catch readers unawares, ripping out your heart and leaving you raw and bleeding for Lina, her family, and all those she comes in contact with as the story unfolds. It’s heart wrenching, and yet, it’s a must read. Even if you don’t want to cry, even if you don’t want to feel raw inside, you need to read this novel. Sepetys’ writing is breathtaking, as is her story of fear, hatred, rejection, and redemption. The characters will melt your heart and you will cry out at the injustice of it all, and you will remember it long after the final page. And we need to remember. For all those who experienced this. For all those who died. Remember. Five stars. Yes, I loved this book too! Shana, your review arrives at EXACTLY the right time for me!! I’ve been wanting to read this myself for quite a while, but had felt rather like you did, not wanting to read something depressing, all about war – despite all the reviews talking about how amazing it is. At the same time, I want to get my mother-in-law some YA books for Christmas and had this tentatively on my list, though I was unsure because I hadn’t read it yet myself (and I know she’d feel the same way as us; not that we want to stick our heads in the sand, but generally I leave learning about war to nonfiction history books!). She is a librarian and worked in a private high school library down in Mobile, AL (where my husband was raised) for about 25 years, so she is a big fan of both MG and YA lit. However, she retired about 2-3 years ago and has mentioned to me that she feels so out of the loop now on what’s good in YA, so I want to buy her some great books for xmas. [She is actually the one who got me interested in YA around the end pf 2011, after much prodding by her and pooh-poohing by me, which then led me to seek out blogs like yours and, well…. two years of obsession later, I feel like I know some 50 of you bloggers and authors personally ;)] Anyway, as I said, I had this book on my list to possibly give her but wasn’t quite sure since I’ve not read it, so your review is PERFECT TIMING and almost like something is telling me “YES, get it, she’ll love it!” Since I trust your reviews so much and almost always agree with your ratings, I am definitely going to buy this for her. Thanks for validating my initial instinct to buy it, and also for prodding ME to get off my tush and read it already! I know you don’t throw out 5 stars all that often, so I’m absolutely going to pick this up!